Figure 5-11. - Recurrent aphthous stomatiti (RAS). are found in the vestibular and buccal mucosa, tongue, soft palate, and in the floor of the mouth. The exact cause of these lesions are not known, but studies show that physical and emotional stress make them appear. Also injuries from toothbrushing, eating harsh foods, and allergies can start RAS. The healing time of the ulcers is usually 7 to 10 days. The viral infections of main concern that will be explained are those caused by the herpes simplex virus (HSV), and the human immunodeficiency virus, also referred to as the HIV (causing AIDS) virus. Both are extremely contagious to you and your other dental patients through cross contamination of dental instruments and dental equipment. Also the virus can gain access via the skin, the eye, or mucous membranes. If you treat a patient with one of these or other viruses, ensure you follow the proper infection control procedures outlined in chapter 10. In oral pathology the most commonly diagnosed sites for HSV-1 are the oral cavity, tongue (fig. 5-12), lips, and the eyes. Direct contact with HSV-1 lesions is probably the most common mode of spread. Transmission through saliva is possible even if there are no active lesions. Infection on the hands of healthcare personnel from patients shedding HSV can result in herpetic lesions. 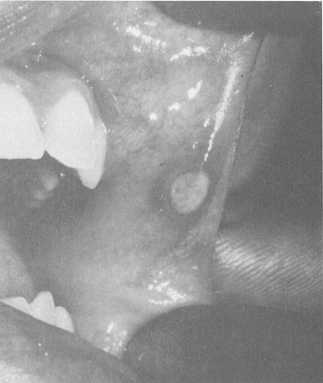 Other lesions of the HSV-1 virus are acute herpetic gingivostomatitis, characterized by red and swollen gingiva. All of the oral mucosa is tender and eating is painful. Vesicles form throughout the mouth and rupture, leaving painful ulcers.